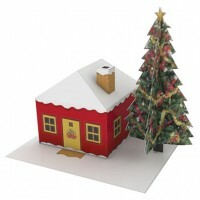 A simple Chrismas House model for kids. I made this model for Christmas Church magazine on my neighbor. Simple enough for kids or newbie to assembly this snowy red house. The Christmas tree is also very simple. I hope you enjoy this model and Merry Christmas! Only took 2 days to model this christmas train, but I quite satisfied, especially the color. The model train is almost fictional but based on a photo reference, I don’t know yet the type of this old locomotive, modeled with looking at the photo and transfer it to 3d model, no measurement no scale, just for fun. 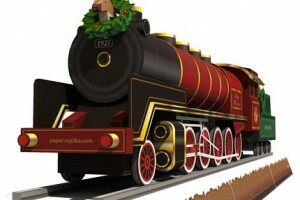 I hope you guys having fun with this model, build together with family or build for someone for a gift on christmas day. You may made modification or recolor the pattern, but please at least mention paper-replika.com if published to public. PAPER-REPLIKA.COM greets you HAPPY IDUL FITRI 1429 Hijriyah , for you who celebrates. May peace upon our world. Eid ul-Fitr or Id-Ul-Fitr, often abbreviated to Eid, is a Muslim holiday that marks the end of Ramadan, the Islamic holy month of fasting. Eid is an Arabic word meaning "festivity", while Fiṭr means "to break the fast" (and can also mean "nature", from the word "fitrah") and so symbolizes the breaking of the fasting period.